Everybody loves making more money, but regularly picking up overtime at your day job isn’t the most enjoyable. Many Americans are turning to side hustles to earn extra cash while doing something they enjoy. 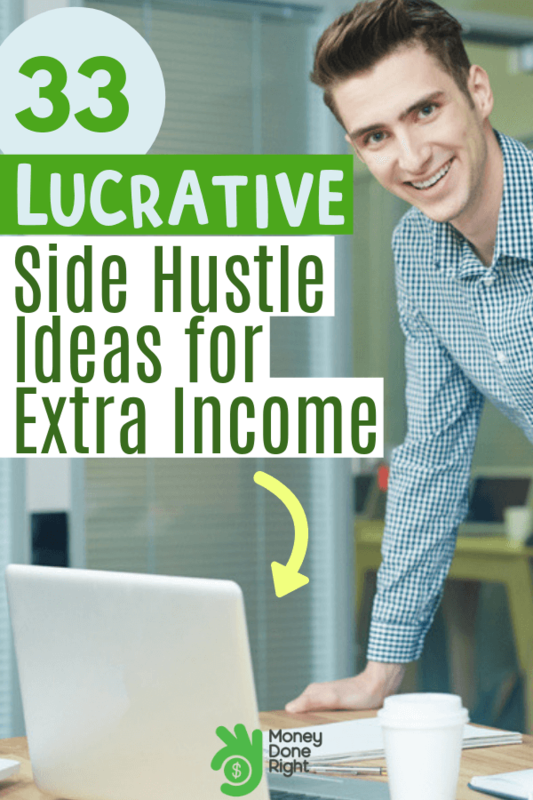 If you’re looking for side hustle ideas, you’ve probably come across hundreds of ways earn extra income every month. While some of those ideas might be impossible or unappealing, there are plenty of options out there that are flexible and lucrative. Depending on your skills and dedication, you can earn well over $1,000 per month from any one of these ideas. In fact, the average side hustler earns over $8,000 per year from their side hustle alone, according to Bankrate. Some of these jobs can earn you cash fast, while others take a while to build up a consistent stream of income over time. How you earn and how much time you invest in your side job is completely up to you. Here are 33 lucrative options that you can use for extra income every month. Want even more ways to earn? Check out 112 Ways to Make Extra Money Now. 19. Download Shopkick and start getting paid to simply walk into stores. What may be a hobby to you could also become a side income. There are tons of people who have turned to their hobbies for additional income each and every month, whether that’s selling a skill or selling products. You don’t have to have a ton of experience to get started with freelance writing. There are many freelance writing platforms out there that are ideal for beginners and experienced writers alike. Writing is ideal if you’re someone who is creative and wants to set their own hours. Depending on the market, type of writing, and specific client, pay typically starts at $0.01 per word for entry-level, very simple writing jobs, and can be as much as $1.00 per word or more for complex pieces. Platforms like Upwork and Freelancer post thousands of new writing jobs every single day, allowing you to apply for top-paying freelance writing jobs right from your home. Graphic design and web design are two of the most in-demand skills on the freelance market today. If you’re a skilled designer or a new designer looking to build your portfolio, freelance is a great way to not only earn some additional cash, but also to get your name out there in the design world. Sites like Fiverr and 99designs are perfect for getting name recognition, and it’s very easy to find regular, high-paying clients on these platforms. Need cash fast? Click here to see how you can earn $100 in no time. Etsy is one of the most popular user-to-user marketplaces in the world, and it’s easy to see why. If you’re crafty and can make beautiful handmade items, you could very easily turn your hobby into a full-time business on Etsy, as so many people have already. This marketplace is home to the world’s most unique creations, from homemade jewelry to custom-printed tee shirts. Even if you’re not crafty, Etsy now has a section for vintage items, where you can find rare and beautiful antiques from around the world. Here are seven more side hustle ideas that you can use to earn extra money. If you have typing skills and want flexible hours, consider becoming a transcriptionist on the side. A transcriptionist listens to audio recording and converts speech into text. In order to be successful, you have to have a good ear and fast typing skills. Top earners can make as much as $2,000 or more per month doing part-time work. As one of the highest paying transcription sites available, Daily Transcription is ideal for both new transcriptionists and those with years of experience. The site pays per audio minute, and rates start at $0.75 per audio minute. That means you can earn $0.75 per minute of audio that you transcribe. As you can see, fast typing skills can certainly have their advantages. You can pick and choose your hours as you’ll be sent jobs directly to your email rather than competing with other workers on the site for jobs. You’ll also get consistent feedback and training to help improve your transcription skills. Earn $15 – $20+ per audio hour by signing up for TranscribeMe, one of the world’s leading transcription service companies. Work is consistent, and you’ll be able to set your own hours and work when and where you want. In fact, top earners on TranscribeMe earn well over $2,000 per month on the site alone, making this one of the most lucrative side hustle ideas around. Our third and final transcription option is Quicktate, which provides unique transcription opportunities to those who sign up to work on the site. Quicktate partners not only with businesses around the world, but individuals as well. You’ll find jobs that range from short voicemails to audio files over an hour long, and the pay is extremely competitive. Transcription work is perfect if you don’t want set hours and want a consistent stream of work and side income. Check out how you can earn $600 fast in this article. Selling your stuff online is one of the quickest ways that you can earn cash. From collectibles and electronics to household items and clothes, there are tons of ways that you can connect with buyers interested in your unwanted items. eBay is the leading online marketplace and is used by millions around the world, making it one of the easiest ways to connect with potential buyers. You’ll pay a small listing fee and eBay will take a portion of the sale as a commission, but you can earn a significant amount of money selling your things on eBay. In fact, many people have created successful online businesses that do all of their product sales directly through eBay. While Amazon is one of the largest online shopping platforms, many people may not realize that virtually anyone can list and sell items on Amazon. With a free Amazon Seller account, you’ll have access to sell items in roughly 20 categories, and can upgrade your account to a premier seller account to virtually double the number of available categories. Categories include books, movies, entertainment, and collectibles. Like eBay, Amazon charges a small fee when your item sells, but it’s easy to earn cash through the Amazon Seller program. Connect with local buyers to get rid of your stuff quickly without any of the selling fees that you’d find with other online marketplaces. Simply upload your item to the app to let others in your area view and negotiate for your item. Once you come to an agreement on the price, simply mark it as sold and meet up with your buyer to meet the purchase. LetGo is extremely popular, meaning it’s not difficult to find buyers for your things. A newer site to the online marketplace world, Mercari is gaining popularity for its ease of use and straightforward fee structure. Rather than paying a listing fee, a commission on the sale, and potentially more one-time fees for special listing features, Mercari takes a flat 10% of the final purchase price. As an added bonus, you can offer free shipping to your customers and have the cost of shipping deducted from the final sales price rather than fronting the shipping cost like you would on other sites. Whether you’re selling your unwanted items or plan to open a business online, these sites can help get you connected with potential buyers. Looking for even more ways to earn? Here are 11 apps that pay you real money. One of the most common side hustles today is driving people to their destinations, delivering food, or both. Even though it’s so common, there’s plenty of additional work to go around. Here are some of the top driving and delivering companies you can work for today. Uber is one of the most popular side hustles in the world, and there are tons of people who actually drive for Uber full-time after quitting their day jobs. With competitive pay and a newly-added tipping option, there’s never been a better time to sign up. Make the most of your time with Uber by also signing up for UberEats. Switch between driving people and delivering food to earn as much as $25 per hour or more. Lyft is another popular option to make some additional money on the side, and many people drive for both Uber and Lyft for maximum income potential. Lyft typically will pay more than Uber, but that depends on factors such as location, time, and destination. What makes Lyft so enticing is the driving challenges that pay out small bonuses upon completion. Drive for certain hours of the day, complete a specific number of rides, or drive in certain parts of town to unlock even more earnings. You can now deliver packages for Amazon through the Amazon Flex program. Pick and choose when and where you want to deliver, and earn as much as $25 per hour as an Amazon driver. There’s always a need for Amazon delivery drivers, and you can manage your schedule and take control of your earnings right through the Amazon Flex app. Looking for quick money? Here’s how you can make it happen. Paid survey sites not only provide you with some extra income every month, but they’re also a way for you to influence some of the top companies in the world. By participating in surveys, you’re being paid for your valuable opinion as a consumer. Companies take this survey data and make meaningful changes to their marketing, product lines, and even pricing. There are tons of survey sites out there, but here are our top three. Survey Junkie is our top paid survey site due to its simple, easy to use interface and above-average payouts for completed surveys. The site has almost 5 million users and provides a steady stream of fun, interesting surveys to take. Once you sign up, you’ll take a short quiz to be matched with surveys based on your interests and shopping trends. Earn points with every completed survey and use those points in the digital store to redeem gift cards or cash payouts. You can earn money through Swagbucks by completing surveys, shopping, and watching advertisements right through the site. When you complete surveys or other eligible tasks, you’ll earn points that you can convert to cash that’s deposited into your PayPal account. Take your earnings on the go with the Swagbucks app. The site has over 15 million users to date and provides a competitive payout structure. As one of the largest consumer marketing groups in the United States, Nielsen is known for influencing what we see on TV. You can register your devices and allow Nielsen to analyze your internet traffic to collect data that companies are looking for. There are no specific surveys that you need to take and there are no activities that you need to complete. Simply sign up, register your devices, and use your internet as normal to start earning rewards and influencing major companies around the world. If you’re looking for even more opportunities and side hustle ideas to make money from home, check out these tips. That’s right, you can earn money by playing games on your phone or your computer. While we aren’t talking about earnings that you’d see with professional eSports players, why not make some extra cash by playing some games in your spare time? Here are some great ways that you can earn money playing games online. Long Game Savings was created to teach consumers better spending and saving habits, and the platform allows you to play games and unlock cash and other fun prizes. When you sign up for Long Game Savings, you’ll open a free savings account that’s FDIC-insured. You’ll answer some questions about your financial health and your financial goals, and Long Game Savings will come up with a tailored savings plan based on your answers. When you meet your savings goals, you can play fun games on the app and win cash and cryptocurrencies as prizes, meaning you’re rewarded just by hitting your savings goals. The companies that partner with Inbox Dollars will now also pay you to play games right through the Inbox Dollars app or site. You can play over 30 fun games including chess, pool, card games, arcade games, and more. All of these games are completely free, and you’re rewarded with cash in your Inbox Dollars account when you play. Want even more ways to earn? Look no further. Cash back apps can offer you insane amounts of cash back on the things you buy every day. While you might not necessarily “earn” money through cash back apps, the amount you can receive is so significant that we had to include these on our list. Ebates partners with thousands of companies around the world to provide you with exclusive cash back offers on your purchases. When you sign up for a free account, you can browse the countless offers on the home page or various category pages. Simply click on the offer you’re interested in, and you’ll be taken to the retailer’s site to complete your purchase. In order to get cash back on your purchase, you must first sign in to the Ebates site and click an eligible offer. Ibotta makes it easier than ever to earn cash backs on the things you buy every day. There are three ways to earn cash back on your purchases; scan a receipt, link your loyalty card, and make purchases right through the app. Simply search the site for relevant offers and add the offer to your cart. After you shop, scan in your receipt to verify your purchase, or link your loyalty card when you’re shopping in the store. You can also make purchases right through the app to get cash back. The app makes it easy to redeem your cash back, allowing you to withdraw your cash via PayPal or Venmo. Check out even more ways to make money this month. If you’re tech-savvy and want to help companies improve the online experience for their customers, testing websites is a lucrative side hustle. Test the interface and design, or do a deep-dive test and review the back-end coding to find bugs. Here are two of the top website testing platforms that pay you the most cash for your testing services. You can test desktop sites and mobile applications right through the User Testing site. User Testing is the largest website testing service in the world, offering plenty of testing opportunities for those looking for a side gig. Browse and select the tests that you’re interested in, from mobile application design to security protocols. The test requires that you record your screen and talk through your test to let developers know what you’re thinking. Pick and choose your tests to take control of your side hustle schedule. Whether you’re a new tester or have years of experience, you can find a test that’s just right for you on UTest. Like User Testing, you can test a website for the way it looks and flows, or you can test programming and bugs. With hundreds of tests available and more tests uploaded every day, UTest is a great way to start off a new side gig. Here are some more side jobs that you should consider today. More and more people are turning to alternative travel arrangements to save money. Here are two ways you can rent out your assets to make a lucrative side income without having to put in long hours like some other opportunities. Instead of renting a car through a traditional car rental agency or ridesharing everywhere, Turo allows users to rent other people’s cars, saving time, money, and frustration in the car rental process. You can quickly list your car on Turo and set its exact availability around your schedule. Why not make money by letting other drivers rent your car when you’re not using it? You won’t have to worry about bad drivers either, as you’re covered with $1 million in liability insurance in case of any accidents. Got an extra room or two? Airbnb can turn the extra space in your home into additional income. Signing up as a host is fast, simple, and free, and allows you to set specific pricing and when your space is available to rent. Airbnb will also make tailored pricing suggestions based on other rentals in your area, meaning you can price your space to attract more renters. Click here for more ways to earn money via lucrative side gigs. By spending just a few hours a week teaching English online, you can quickly earn an impressive side income. Not only can you earn more money, but you can help children and adults around the world learn English in a fun, interactive online environment. QKids is a leading online English program that pays teachers as much as $20 per hour. The sessions typically last less than an hour, and you can book as many or as few as you want. Once you sign up, you’ll complete an online assessment and a mock teaching session to ensure you’re right for the role. QKids teachers love what they do, so if you’re interested in helping people around the world while making a great side income, consider signing up today. Another popular teaching platform, VIP Kid pays its teachers as much as $20 per hour teaching English to students around the world. There’s plenty of work available and you can pick and choose your availability throughout the week. A successful VIP Kid teacher has a positive attitude and excellent teaching skills. The best part about teaching for VIP Kid is that all lesson plans are created for you, allowing you to focus on your students instead of worrying about class preparations. If you have specialized knowledge, such as advanced math or science, Cambly may be a great option for you. Cambly is another platform that allows you to teach English to students around the world as well as your specialized skills. This also means that there’s an opportunity to earn even more. Cambly is also a chat-based platform, meaning you don’t need to have video calls with your students while you’re tutoring them. Here are over 100 more side hustle ideas. Get started with any of them today! Share your skills with the world by creating fun, interactive, informative courses. Many people are turning to online learning versus traditional educational paths, meaning now is a great time to create and sell high-quality courses online. Here are some of the top platforms where you can sell your courses. Udemy is the world’s leading user-to-user course creation site, with thousands of courses listed in countless categories. No matter what you’re passionate about, you can create a course for Udemy. Top courses include software, photography, writing, and marketing. You’ll get free guidance on planning and creating your course, and with over 20 million students around the world, Udemy lets you reach more students than ever before. Another top online course platform, the top-selling teachers on Skillshare earn well over $100,000 per year, all by selling courses on things they love. When you create a course on Skillshare, the platform actually markets your course to draw in more students. The more students you have, the more Skillshare makes, so it makes sense for them to partner with you on growing your student base. The final user-created course platform on our list is Teachable. Teachable has paid out over $100 million to teachers since it was founded, as has over 7 million students worldwide. Like Udemy and Skillshare, you’ll be given the tools, resources, and support you need to succeed creating courses online. Check these side gigs out for even more ways to earn. Still not sure if these side hustles will work for you? Here are even more great side hustle ideas. Avon has been around for generations and is one of the most widely known companies in the world. Offering high-quality beauty products, you can sign up to be an independent Avon representative. You can work when and where you want, and you’ll be given the tools to be a successful Avon representative, where you can earn up to 40% commission on all of your sales. TaskRabbit connects you with locals in your area that need help with odd jobs around their home or business. Build furniture, help with yard work, or help with a move across town. When you sign up, you can select your skills and interests and may have to take a skills test to be accepted into certain categories. Set your prices and connect with people in your area who need help with odd jobs. These are just a few of the things you can do to earn some serious additional income every month. For even more side hustle ideas, check out 112 Ways to Make Extra Money Now. Have you made a side hustle work for you? Tell us your story in the comments below!